There is no more important design decision affecting the look and feel of gameplay in the ETO series than how to model the German Army. The Wehrmacht appears on every front and is, in many ways, the principal actor in the drama. It is the standard against which every other army is compared (and tested against in play), and if its portrayal does not ring true, every other chord in the game will seem off-key as well. So what are the essential characteristics of the German Army that must be correctly modeled? The first thing is the Infantry, because it's the bulk of the Wehrmacht. 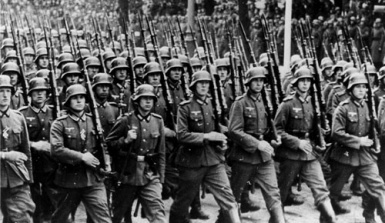 The German Infantry started out as world-class, or at least got to that level by the France 1940 campaign. It experienced some hiccups in the Polish campaign but learned a lot of lessons, giving it an edge over about every other major European army. But as the war continued, the losses started piling up; German replacements were more hastily trained and, in many cases, less physically able to stand up to the rigors of prolonged combat. By 1942 the Soviets were noting a reduced level of aggression by the German Infantry, and by 1943 they felt the German Panzers were carrying almost the entire burden of offensive operations. Still, the Germans' ability to hold the line did not seem to diminish at this time, only their offensive punch. Finally, by the end of the war, the Germans were scraping the bottom of the barrel, calling up both younger and older recruits than previously. Even then, there were always a few good German Infantry units around that you could count on to deliver a solid attack when you needed them. So how do we model this history? The core early-war German Infantry units are represented by 6-4 (combat-movement) Corps. These represent the Corps formed at the start of the war with the pre-war 1st Wave (and some 2nd Wave) divisions. Each of them also generates a Korpsgruppe (KG, explained below) when it loses its second (final) step in combat, and the Korpsgruppe can be rebuilt to a reduced strength Corps unit for half price, or for free if pulled out of the line and rested in a City hex for a turn (the latter being a special German-only ability; their good units were extremely resilient). That's a big advantage which not all Infantry units have; symbolizing this is a Medal icon "pinned" on that unit. The Korpsgruppe: We required a standard to determine which units "deserved a Medal" (i.e., would receive the ability to form Corps Remnant units when eliminated). We set that standard at: 2-step (full-strength) Corps units with 6 Strength Points (for either Attack or Defense) plus, for the Soviets, their 1-step (full-strength) Guards Infantry and Guards Mechanized Infantry Corps. Looking over the pre-production counters for every ETO series game, this standard coincided very well with military organizations and doctrines across all nationalities. Only the very best Corps units gained this amazing "third step" and resilient replacement ability provided by a small Corps Remnant unit. T hose 6-4 Infantry Corps units all exist in 1940 and the counter mix limits you to exactly that many. The standard German Infantry Corps units raised next are 4-6-4s, just as good on defense but not as good at punching. They also have a medal and therefore generate a Korpsgruppe losing its final step. Again, the counter mix limits how many of these quality German Infantry Corps you can raise; after that you can raise a few 4-4 German Infantry Corps representing those raised in 1943 mostly to fight partisans and garrison the Balkans. The 4-4 Corps are less resilient, as well, because they do not form Korpsgruppes. The ETO series makes all of these German Infantry Corps available from the start, but since they all cost exactly the same to raise, players will not create 4-6-4s as long as there are still 6-4s in the Force Pool, and likewise will wait on the 4-4s until there aren't any better units remaining. The games do not force any withdrawals, expecting Axis players will place a premium on keeping their better Corps at full strength. They will just become a smaller and smaller part of the German force over time. One more type of Infantry Corps is the 2nd-line Infantry (shown with a "hole" in its unit symbol). These are only 2-4-3 units, without a Korpsgruppe, but they only cost half as much as a regular Infantry Corps, making them a good buy when you need to defend a lot of ground. These units were raised throughout the war, first to hold the upper Rhine fortifications against the French, then to garrison the long coasts of France and Norway. They represent static divisions and the Luftwaffe Field Divisions as well. They are also the bulk of the rear-area anti-partisan forces (those that show up on the map, anyway). Specialist Infantry units include paratroopers and mountain troops, most of which are 6-4 Corps. These remained reliable offensive troops throughout the war, but the counter mix greatly limits their number. In addition, the replacement rules allow only one Replacement Point (RP) per month to go to Specialist units such as these, so you cannot rapidly use them up over and over again. Schnelltruppen, the Mobile Divisions and Corps which, throughout the war, were the main offensive instrument of the German Army. The centerpiece is the Panzer Corps, a 12-9- mini-monster, with a Korpsgruppe when it loses its final step. It is strong enough to cause its opponents a lot of trouble when it attacks (and can overrun enemy units) but it is not as good at holding the line (although still better than any Infantry Corps). Each Panzer Corps breaks down into two 4-2- Panzer Divisions and one 2- Motorized Division, so you can see the Corps loses considerable power when it disperses, more so than most Corps when they break down. For example, a 6-4 German Infantry Corps breaks down to three 2-4 Divisions suffering no loss of strength at all (these 2-4s are not in Thunder in the East; they are in the ETO series counter mix where Minor units are needed for Wilderness Theater operations in the Arctic and Desert). Note, however, that Panzer Corps do not deteriorate over time; those raised at the end of the war are the same as those at the start. The odds of them being at full strength in 1945 are pretty low, however. We decided not to have different levels of quality for these units as the German Panzer Divisions always had the better manpower and attracted more aggressive young officers. 2- Motorized Divisions change to 3- Panzergrenadier Divisions, although this has no effect on the strength of the concentrated Corps, only its breakdown. Finally, a word on Large German Army-size units: Aside from Panzer armies, there are two types of German Infantry Army counters in the game: 12-10-3 (made up of two 6-4 Corps) and 10-3 (made up of one 6-4 and one 4-6-4 Corps). How did we decide which was which? Easy. The armies at the start of Barbarossa which had two (or more) of the top-line 6-4 Corps are represented as 12-10-3s, because they are the armies which can actually make that counter from the forces historically assigned to them. Those armies with only a single 6-4 plus a 4-6-4 are shown as 10-3s.